Edward Emerson Barnard (December 16, 1857 – February 6, 1923) was an American astronomer. He was commonly known as E. E. Barnard, and was recognized as a gifted observational astronomer. He is best known for his discovery of Barnard's Star in 1916, which is named in his honor. n 1892 he made observations of a nova and was the first to notice the gaseous emissions, thus deducing that it was a stellar explosion. The same year he also discovered Amalthea, the fifth moon of Jupiter. He was the first to discover a new moon of Jupiter since Galileo Galilei in 1609. This was the last satellite discovered by visual observation (rather than by examining photographic plates or other recorded images). In 1895 he joined the University of Chicago as professor of astronomy. There he was able to use the 40-inch (1,000 mm) telescope at Yerkes Observatory. Much of his work during this period was taking photographs of the Milky Way. Together with Max Wolf, he discovered that certain dark regions of the galaxy were actually clouds of gas and dust that obscured the more distant stars in the background. From 1905, his niece Mary R. Calvert worked as his assistant and computer. The faint Barnard's Star is named for Edward Barnard after he discovered in 1916 that it had a very large proper motion, relative to other stars. This is the second nearest star system to the Sun, second only to the Alpha Centauri system. 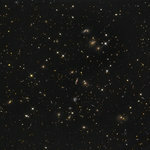 He was also a pioneering astrophotographer. 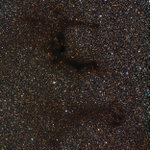 He cataloged a series of dark nebula giving them numerical designation akin to the Messier catalog. They begin with Barnard 1 and end with Barnard 366. He published his initial list with the 1919 paper in the Astrophysical Journal, "On the Dark Markings of the Sky with a Catalogue of 182 such Objects". He died on February 6, 1923 in Williams Bay, Wisconsin, and was buried in Nashville. After his death, his exceptional collection of photographs was published in 1927 as A Photographic Atlas of Selected Regions of the Milky Way, having been finished by Edwin B. Frost, then director of Yerkes Observatory, and Mary R. Calvert.